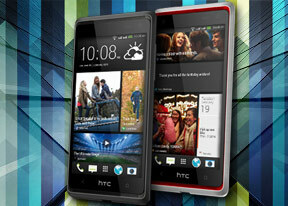 The calendar on the HTC Desire 600 dual sim has five different types of view: Month, Week, Day, Agenda and Invites. You can swipe between different months/weeks/days like you would through tabs in other Sense 5 apps. Adding a new event is quite straightforward and you can also set an alarm to serve as a reminder. Naturally, the Calendar supports multiple online calendars (including Facebook), only one of which you can sync with your computer. You can also easily show/hide the ones you don't want. The Agenda view shows a list of all the calendar entries from the recent past to the near future. Invites view only lists events with invitation info attached to them. The day view also shows the weather forecast at the top of the screen, which is a nice touch. The Clock app comes with World Clock, Alarms, Stopwatch and a Timer. The World clock is like a mini Google Earth - it shows a 3D globe and you can rotate and zoom in on it freely. You can add cities that are pinned to the globe (and also visible as a list below it). The alarm clock application can handle multiple alarms, each with its own start and repeat time. The stopwatch and timer are pretty self explanatory. The HTC Tasks app is here as well. It does exactly what the name suggests and can access your Google Tasks. There is no location-based reminder support unlike with Any.DO, iOS's Reminders, etc. HTC Note app is also onboard. It is somewhat similar to Samsung's SPen - you can take various notes, add drawings, pictures and dictations. Sharing and printing options are also available. HTC's Weather app is here too. It became popular years ago with its cool weather animations and widget. You can preset many cities across the globe and it uses the AccuWeather info (much like Samsung and Apple do). Unfortunately there is no HTC Hub in the Jelly Bean version of HTC's Android implementation. This means you can't get additional HTC wallpapers, HTC lockscreens, etc. The HTC Desire 600 dual sim has a built-in GPS receiver, which managed to get a lock in under a minute. If all you need is a rough idea of where you are (within 150 meters) you can use the Cell-ID and Wi-Fi network lock, which is very fast as well.